Subscribe to my monthly blog updates! Click here to subscribe to The Book Don's RSS Feed. “Nujood Ali and the Fight Against Child Marriage,” forthcoming in 2015, will be Katherine’s second nonfiction YA book with Morgan Reynolds publishing. “Real Courage: The Story of Harper Lee,” Katherine’s first YA biography, was published by Morgan Reynolds Publishing in 2013 as part of their World Writer’s series for YA readers. 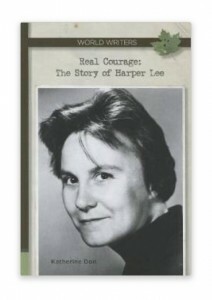 Booklist called it “a fine new entry into an ever-solid series,” and School Library Journal calls it a “solid, accessible biography” that is “straightforward and engaging.” Please visit Amazon.com to purchase a copy, or visit the Morgan Reynolds website to purchase copies in bulk at a reduced price for use in school libraries or classrooms. Between 2008 and 2010, Katherine was a contributing writer to six nonfiction books. Below is a short selection of her articles from these books. Did Custer Make a Stand? How Many Words do the Eskimos Really Have for Snow? Bram Stoker and Henry Irving: Close Friendship or Unrequited Love?